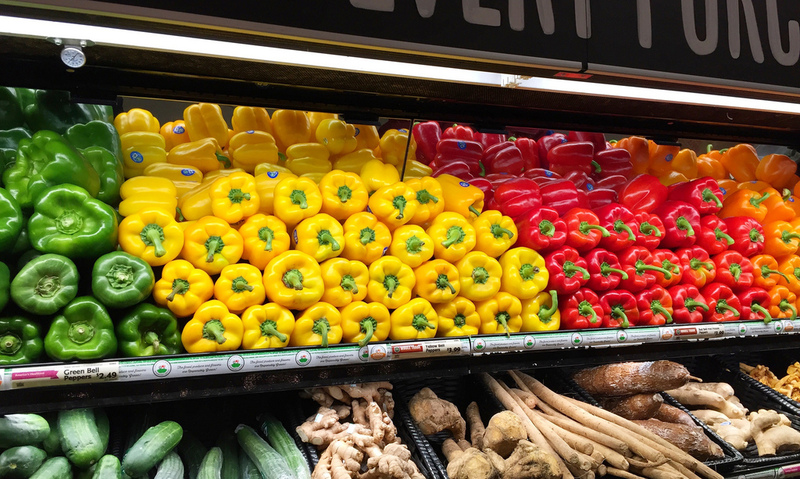 Red, orange, green, and yellow bell peppers remind me of colorful Christmas tree ornaments, so use that to your advantage this holiday season to introduce your family to nutrient-packed peppers. 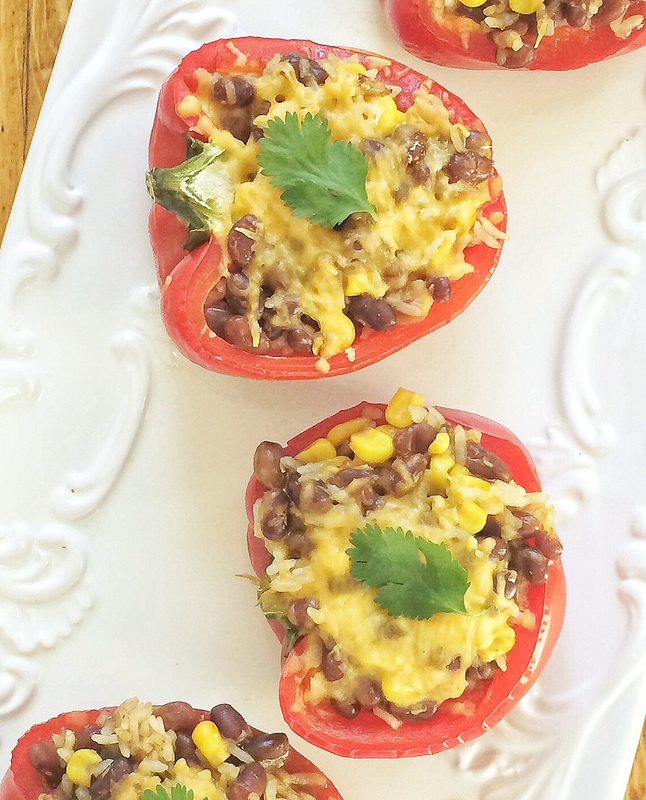 … or use them as the foundation for these fun-to-eat Corny Bean Bell Pepper Boats. 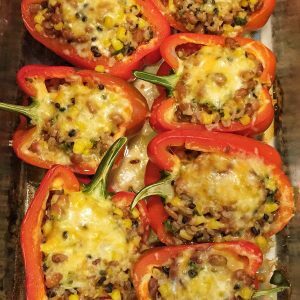 My stuffed pepper recipe is vegetarian and gluten-free, and if you leave out the cheese, it’s also vegan. 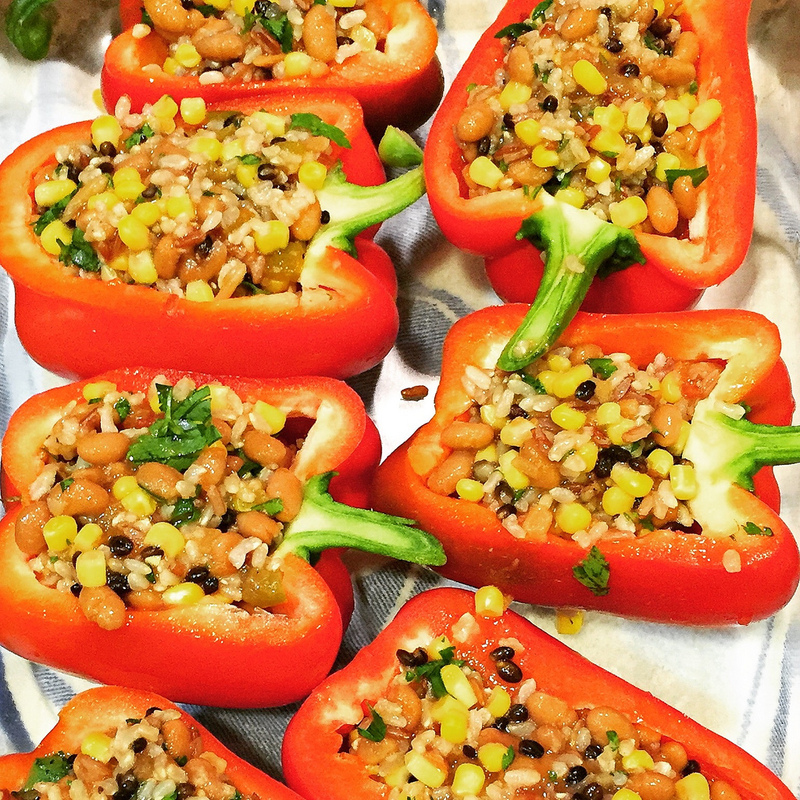 My vegetarian stuffed peppers are filled with a mixture of canned baked beans, corn kernels, rice (I used a frozen rice medley from Trader Joe’s), salsa, and cilantro. If you’re a cilantro hater, just leave it out! I use red bell peppers for this recipe, but any color would work well. As for the filling, you can shake that up too by adding veggies like chopped kale or spinach or toss in some diced cooked chicken or sausage. Cut each bell pepper in half, lengthwise. Remove the seeds and ribs, leaving the stems intact. Set aside. Place the rice, beans, corn, salsa, and cilantro in a large bowl and stir to combine. 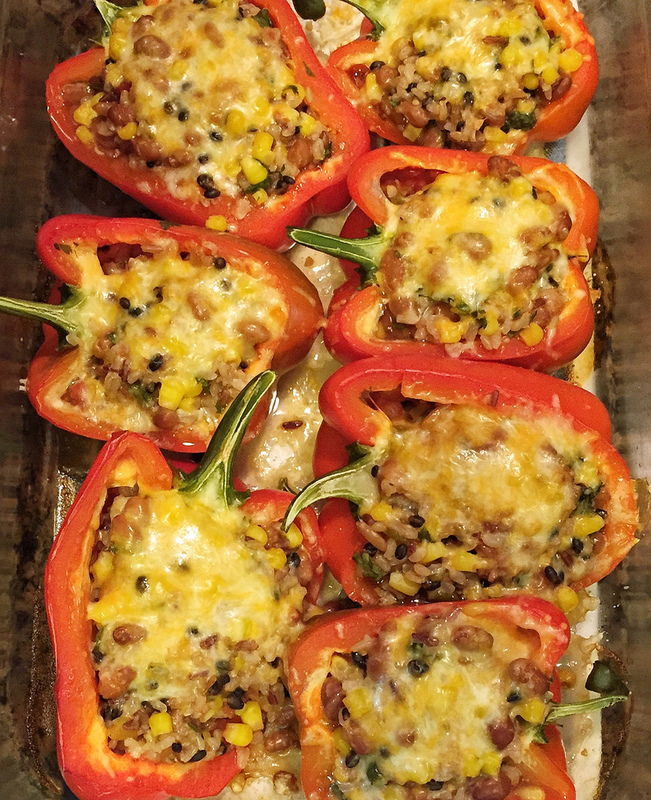 Fill each of the pepper halves with the rice and bean mixture (a generous ½ cup per pepper half). Arrange the peppers in a 9 x 13-inch baking dish and cover tightly with aluminum foil. Bake until the peppers are tender, 40 to 45 minutes. Remove foil and sprinkle evenly with the cheese. Return to the oven until the cheese melts, about 5 minutes. Each serving has nearly a day's worth of vitamin A and over 200% of your daily requirement for vitamin C. Your immune system will thank you! What other recipes are you making this holiday season? Yum! Bell peppers make the perfect foundation for stuffing 🙂 I usually make a salad and desserts. These would be fun for kids to help make too! Love this idea! Wow this looks yummy for veggie lovers. This is the best way to attract picky eaters.